BCA: British Car Auctions report that used car sales have been hit by the recession, some 42% out of 2,000 motorists surveyed reporting that they will not be replacing their cars until the economy picks up. The effect of the Government scrappage scheme and reduction of new sales seems to have actaully pushed up values of second hand cars. CITROEN: Colour satellite navigation has been introduced as standard on the executive class Citroen C5 VTR+ model. FIAT: the Fiat 500 has won the Auto Express Best City Car award for the second year running. For the previous four years the award had gone to the Fiat Panda. PEUGEOT: Peugeot will be launching its new 3008 model range this November. A cross-over family type vehicle, slightly longer than the 308 model range, it combines MPV, SUV and hatch back characteristics and will be offered with a range of six engines and three trim levels with prices from £15,995. A 5-star NCAP safety rating has already been achieved. VOLKSWAGEN: A special Match version of the Volkswagen Touran compact 7-seat MPV has been introduced. Priced at £19,515 on the road it features £1,600 worth of additional equipment – including satellite navigation, park assist with front and rear parking sensors – for only a £500 premium. levels as low as 89 g/km are claimed. VOLKSWAGEN: The new Polo small hatch back model will be launched in the UK this October. ESP will feature as standard on all models. Prices will start at £10,035 for the 1.2 S 60 PS 5-door. A cheaper 3-door will follow in December. Cars with metal folding roofs were pioneered by Peugeot in the 1930s though the contemporary accounts I have read about their early efforts gave me the impression that success was overshadowed by the many other inventions that abounded in the car world at that time. Thus it was not until the dawn of the 21st century that this always forward thinking French car manufacturer got back to offering cars with this sort of roof in the form of the diminutive 206CC. It appeared a daring venture when the car was first spied at motor shows, possibly a very small niche market for a car based on a versatile mass sales hatch back, but surely one that would not pay its way?. It did not take long before heads were being turned in more than one party; those of the motor industry who saw the burgeoning sales of the Peugeot product and those eager motorists craving a bit of spice to their motoring. Despite diminutive dimensions the Peugeot 206CC and its successor the 207CC have been in great demand but for those seeking a bit more creature comfort in the way of larger interior space Peugeot expanded the exercise to create first the 307CC and this summer the 308CC. Viewed side by side there is a lot of similarity between the 307 and 308CC though this latest folding top Peugeot benefits from much smoother styling and, importantly in my view, the vastly improved standards of finish that has permeated though the current range of Peugeot products. Here is a class act; that looks the part from all aspects and close examination when sitting in the exceptionally comfortable figure-hugging driving seat gives an impression of a premium class automotive product. I can see potential buyers being both attracted by the quality and by the lifestyle that this car provides. 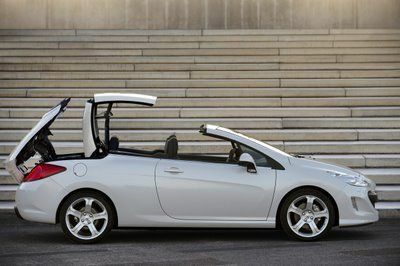 The body concept is just the same as the 307CC in so much as it can easily double as a fully open cruiser or a snug coupe at the touch of a switch and in a sufficiently rapid action roof changing operation that is able to respond to the vagaries of the British weather. The deeply raked windscreen allows air flow to pass over the top of occupant’s in a manner that hardly ruffles a hair on the head and with such uncanny quietness that civilised conversation can be carried out at motorway speeds. An Airwave temperature controlled neck heating system (standard across the entire model range) is more of a comfort than a gimmick. Unless you are young and relatively small of stature the two rear seats are not a lot of fun. Leg room is tight, the wind when in open top mode can buffet you a bit and the back of the large glass rear window encroaches on your head space when the roof is closed. I would best describe this one, (in company with most of its obvious rivals) as an occasional four-seater. On offer is a range of variants powered by proven Peugeot mechanical packages; you can have diesel or petrol with combinations of manual 6-speed gearboxes or a responsive automatic and four specification packages – Sport, SE, GT and GT 100. Power outputs range from 110bhp up to 150 and for my drive I used the mid-range 1.6-litre petrol fuelled THP version producing a very willing and refined 140bhp and driving the front wheels through a very responsive 6-speed automatic. This proved a sensibly equipped version with items like automatic headlamp actuation, rain sensing wipers, rear paring sensors, cruise control with speed limiter, six SMART airbags (NCAP safety rating is an impressive 5-star) and a category 1 Thatcham alarm system. Cosmetic touches include retro-styled instrumentation and lather covering to the not quite round steering wheel. This is a cruising car rather than an outright sporting machine but that does not mean that there is nothing for the discerning driver. The platform and running gear has a very good pedigree which ensures a positive and fairly light feel to the controls, very good road grip, a competent but firm ride and a very satisfying turn of performance. Peugeot claim a top speed of 127mph with 62mph (100kph) reached in a passable 12.4 seconds. That’s good for a car that carries a bit more weight than the comparable hatch back version and also commendable is a combined fuel consumption of 34.8mpg. The enduring easy driving and civilised character that has been the hallmark of all these modern generation Peugeot CC models is strongly evident with this particular car to a degree that owners accept that limited rear accommodation, the stretch to close the large and heavy doors and are also inventive in utilising what is a better than average for the class luggage capacity when the two-part roof is stowed. It is evident that this latest 308CC Peugeot has staked an even stronger claim to this sector of the market. Main Rivals: Audi A3 Cabriolet £1.6 Sport £21, 745, Vauxhall Astra 1.6i Twin Top Sport 113 £20,565, BMW 118i ES Convertible £22,460, VW Eos 1.4 TSI 160 SE £22,110, Ford Focus 1.6 CC 1 £20,745. Price: From £22,295 on the road.